On March 22, 2014, Metropolitan Hilarion of Volokolamsk, who hosts the Church and World talk-show on Russia-24 TV channel, had as his guest the editor-in-chief of the Religion and Mass Media portal, journalist Alexander Shchipkov. Metropolitan Hilarion: Good afternoon, dear brothers and sisters. You are tuned to the Church and World program. Today we will discuss Ukraine. My guest is journalist Alexander Shchipkov, editor-in-chief of the Religion and Mass Media portal. Good afternoon, Alexander. A. Shchipkov: Good afternoon, Your Eminence. Ukraine is seething. The situation and events are developing with a catastrophic pace, a kind of motion picture speed. The situation is tense. Everybody is talking about political components alone and it is clear why. But as an Orthodox Christian and journalist I am concerned for the religious component. As is known, Ukraine is a place of heightened religiosity. There are many Protestants; the Greek Catholics are strong and, unfortunately, there is partitioned Orthodoxy. There is a major Ukrainian Orthodox Church, which predominates, and there are entities of non-canonical nature. In your view, how may the religious situation develop? What may happen in the nearest future? Metropolitan Hilarion: First of all, I would like to say that the sad events, which happened early this year in Kiev and which caused a bloodshed and death toll, have not made Ukrainian religious confessions to stay aside. There were church and semi-church groups that took a very clear political stand on one side of the barricades. For instance, the Greek Catholics you have mentioned. In the person of the Major Archbishop Svyatoslav Shevchuk as well former Archbishop Lubomir Husar, who is retired now, they took a very clear stand from the very beginning of this civic confrontation, which was to grow, unfortunately, into an armed bloody conflict. They did not just stand up for the so-called Euro-integration but even called Western countries to interfere more actively in the situation in Ukraine. It even came to the fact that Archbishop Svyatoslav Shevchuk together with the false patriarch Philaret (Denisenko) went to the USA and batted around the State Department offices asking the USA to interfere in the Ukrainian affairs. It was one stand. 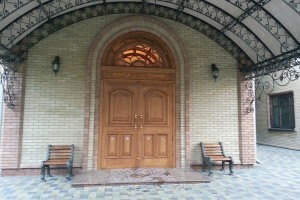 There is another one, taken by the canonical Ukrainian Orthodox Church of the Moscow Patriarchate. It is not merely a stand of non-interference in politics; it is a stand based on the fact that the Church should give room to people of diverse political beliefs, except for openly radical and chauvinistic. Among the faithful and clergy of the Ukrainian Orthodox Church, there are a great number of those who are not proponents of Euro-integration. There are those who participated in the events in Maidan. But at the same time, among the faithful of the UOC, there is a great number of those who aligned themselves with Russia, who stand for the preservation of Holy Rus’ as a single spiritual space sealed with the same faith. The canonical Orthodox Church holds all. She does not take a particilar side of the barricade. She unites all, and if need be, stands up between the warring parties, as did the monks who came out to stand up at the risk of their lives and health to prevent bloodshed between the two warring parties. A. Shchipkov: Were they monks of the canonical Orthodox Church? Metropolitan Hilarion: Yes. These were monks of the canonical Church. A. Shchipkov: I had an occasion to talk with Ukrainian Uniates, Greek Catholics. They said: A certain mission is placed on us since we unite Eastern and Western Christianity. I responded to that rather sceptically, saying that for all these declarations, for the distinctness of theirs, they are in a sense a Catholic project. They make the liturgical mention of the Pope of Rome and stress their belonging to the Western world. It may be the reason why they look to this Western world. But still they are a minority. The majority in Ukraine are Orthodox. 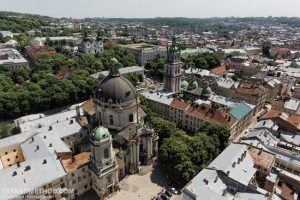 Relations between the canonical Church and the two non-canonical entities – Philaretians in the so-called Kiev Patriarchate – and the Ukrainian Autocephalous Church, how can they develop? Is any dialogue possible? Is it necessary at all, and how can it develop? 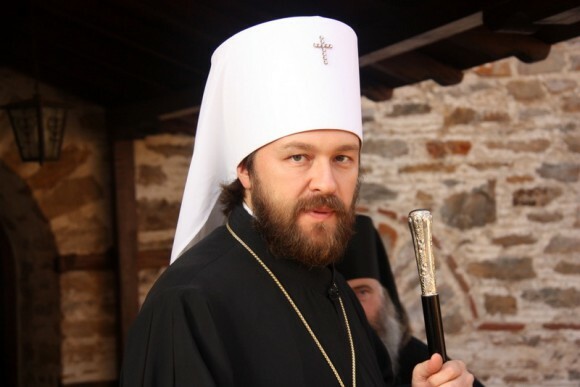 Metropolitan Hilarion: To sum up the theme of the Uniates or Greek Catholics, in fact, from Rome’s point of view, the Uniates should serve as a bridge between East and West. Actually, this project was conceived as such. But this special project of the Catholic Church has always been perceived by the Orthodox extremely negatively because, as a matter of fact, the Uniates are people who wear Orthodox clothes, observe Orthodox rites while remaining Catholic. This peculiar status gives a certain room for manoeuvre both to the Greek Catholics themselves and to the Vatican. For instance, I happened to talk to some high-ranking Vatican officials concerning that stand taken by the Greek Catholics. I asked: How is it possible at all for the Greek Catholic Church to support the schismatic so much that they hold joint actions, prayer services and make joint trips? The answer was: But they are autonomous; we in the Vatican do not control them. I then said in precisely your words: But the Unia is your project; it is not our joint project. If you do not control it, then you might distance yourselves from these actions? But you do not do it either. Therefore we state that these actions of the Greek Catholics throw us backwards, also in our dialogue with the Roman Catholic Church. We cannot fully tell apart the Greek Catholics and the Roman Catholics. As for dialogue between the canonical Church and non-canonical church entities in Ukraine, I believe this dialogue has a perspective. It is not accidental that precisely now, at a time so difficult for Ukraine, the Ukrainian Orthodox Church has initiated this dialogue, not just resumption, but actually the beginning of dialogue because there has been no full-fledged dialogue so far. The point is: in what way this dialogue will go and what principles it will be based on. When a few years ago an attempt was made to begin such dialogue, the first request made by the schismatic entities was this: Let you first recognize our sacrament of baptism; do you really think that we are like Muslims, that even our baptism is invalid? I believe it is not the proper starting point to begin with because the recognition of the baptism will actually mean a partial recognition of the sacraments. Then the schismatics will say: They have already recognized our baptism and soon they will accept our priesthood as well and eventually they will recognize our validity. Still, the dialogue should be about the ways of reunification with the Church to be observed by those who have fallen away from her, as Primates of Local Orthodox Churches wished it to be and stated it in their message to the Christians in Ukraine who are outside the Church today, adopted a few days ago in Istanbul – Constantinople. A. Shchipkov: Your Eminence, could you tell us in a little more detail about what took place in Istanbul? What was the aim of the meeting of Primates of Orthodox Churches? What decisions were made concerning Ukraine and not only Ukraine? Metropolitan Hilarion: First, the Primates of Churches met to define the way of preparing a Pan-Orthodox Council. The Pan-Orthodox Council is a project that has been in existence for over 50 years. The preparations for it have been carried out since 1961. After the Istanbul meeting, the preparations entered the final stage, that is, if nothing prevents it. If the documents drafted for the Council are finalized in the remaining time, the Council make take place already in 2016. This is what the Primate of Local Orthodox Churches discussed. A. Shchipkov: It will be a grandiose event. With your permission, let us move back to Ukraine. They often say that the Ukrainian Orthodox Church may break off the Russian Orthodox Church. What are their relationships today? Are these two equal structures or is it a single Church? How to sort out this situation? Metropolitan Hilarion: To make it intelligible as far as possible for our viewers, I would put it in this way: the Russian Orthodox Church unites believers in Russia, and Ukraine, and Belarus, and Moldova, and a whole number of other states. But in some of these states, the local Church has a self-governing status. It means that, for instance, the Ukrainian Orthodox Church of the Moscow Patriarchate is a part of the Russian Orthodox Church but it is self-governed. She elects her Primate on her own; she is fully independent both financially and administratively. The bond preserved is a spiritual bond. It is expressed in the liturgical mention of the Patriarch of Moscow and All Russia as Primate of the one Russian Orthodox Church, and the mention of the Metropolitan of Kiev is made after him. There is another, rather symbolical, relation in that after the Ukrainian episcopate elect their Primate, this election is to be approved by the Patriarch of Moscow and All Russia. This is in fact all that lies in this bond. A. Shchipkov: That is to say that Moscow cannot influence the personnel policy of the Ukrainian Orthodox Church? Metropolitan Hilarion: No, it cannot, but Kiev can. A. Shchipkov: This is precisely the question I wanted to ask, because His Beatitude Metropolitan Vladimir is the permanent member of the Synod of the Russian Orthodox Church. A. Shchipkov: And the episcopate of the Ukrainian Orthodox Church, do they take part in our Councils? Metropolitan Hilarion: All the bishops of the Ukrainian Orthodox Church participate in the Bishops’ Councils of the Russian Orthodox Church. And the Holy Synod meetings are attended, along with His Beatitude, by one more hierarch of the Ukrainian Orthodox Church. The Ukrainian Church is represented in the central governance bodies and does have an opportunity to influence the decision-making in the Russian Church. For instance, if we want to elect a bishop but His Beatitude Metropolitan of Kiev is against his nomination, then we will not elect him. And if in Ukraine they want to elect a bishop, we will have no opportunity to interfere from Moscow and to state our objection. This is how the self-governance status works. I would like to come back to your question that I have not yet answered: What actually the Primates of Churches said about Ukraine in Istanbul? Their response consists of three parts. First, all the Primates call for a peaceful and bloodless way of settling all the problems in Ukraine. Secondly, any forcible captures of churches or monasteries are inadmissible. Thirdly, the whole Orthodox Church is praying that those in the schism, outside the Church, may come back to the Church. These are the three points which the Primates stated together with regard to Ukraine. A. Shchipkov: It is quite an important detail. 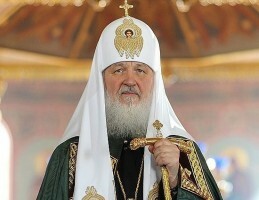 The Primates of Orthodox Churches called to Church unity. They stressed there is a canonical structure and invited people to return to it. Metropolitan Hilarion: In fact, this is the longed-for reunification of the Ukrainian Orthodoxy for which we hope and pray. A. Shchipkov: I hope it will happen. Although it seems to me personally that it will be an extremely complicated process. When I travelled around Ukraine a few years ago making a research, I discovered that the religious passionarity in Ukraine is very high, while they are continuously dividing something between them. In Russia we often do not know the situation there. I have been to villages where I could see the most brutal conflicts between Protestants and Greek Catholics, almost a war. There were no Orthodox Christians at all. It is not surprising for me that Protestants, too, play such an active role in religious life in Ukraine. Your Eminence, what do you feel as a hierarch and a man: how long will the Ukrainian Orthodoxy need to heal this tragic division? Metropolitan Hilarion: I am not ready to make any predictions because experience has shown that it takes decades, as was the case with the division which used to be in the Russian diaspora. It was not for one decade that we awaited the reunification which took place in 2007. Although the political circumstances seemed favourable enough for it to take place even earlier. We can only pray and patiently work for it to happen. The present crisis, which gripped the Ukrainian society, gives the Church, first of all the canonical Church, a unique opportunity to unite and reconcile all. The socio-peacemaking mission of the Church is the most important thing we are seeking to do at the Holy Synod meetings and is being done today by the Ukrainian Orthodox Church of the Moscow Patriarchate. I hope that in a situation where such a serious confrontation develops between two political systems, between two countries, the Church can play and will play her unique role of reconciliation.